One of the great classics and a bartender favourite. Born in Italy the Negroni has a beautiful balance. It is strong, floral, bitter and sophisticated. Perfect before dinner as an aperitif, it is one of those cocktails that has a cult following. The Negroni is one part Bulldog Gin, one part Cinzano Rosso sweet vermouth and one part Campari, garnished with orange peel. 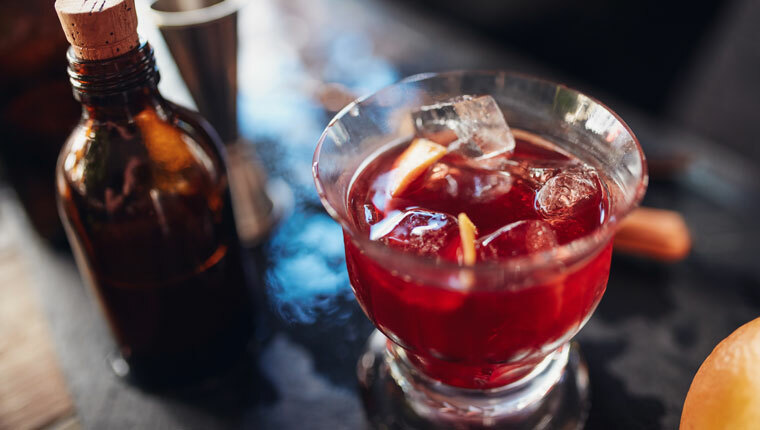 The Negroni was invented in Florence, Italy in 1919, when count Camillo Negroni asked the bartender at Café Cassoni to strengthen his favourite cocktail, the Americano, by adding gin rather than the normal soda water. It spread to America and Europe and grew as a bartender favourite. Truly unique. The Negroni is greater than the sum of its parts. Bitterness comes from the Campari. Gin brings strength and floral notes. The Cinzano Rosso brings sweetness and herbal tastes. Served over ice, the cocktail slowly dilutes and each sip reveals something new. It's astonishing that so many different flavours can blend so seamlessly. If you substitute the gin in a Negroni with soda water you have the more tame apéritif called the Americano. 1. Build all ingredients in a short glass filled with ice. 3. Garnish with orange peel and serve.